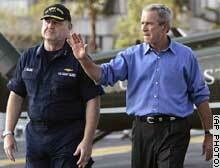 This just in: Tape: Tape: Bush, Chertoff Warned Before Katrina. In dramatic and sometimes agonizing terms, federal disaster officials warned President Bush and his homeland security chief before Hurricane Katrina struck that the storm could breach levees, put lives at risk in New Orleans' Superdome and overwhelm rescuers, according to confidential video footage. The footage - along with seven days of transcripts of briefings obtained by The Associated Press - show in excruciating detail that while federal officials anticipated the tragedy that unfolded in New Orleans and elsewhere along the Gulf Coast, they were fatally slow to realize they had not mustered enough resources to deal with the unprecedented disaster. Remember this quote, four days after the hurricane struck? "I don't think anybody anticipated the breach of the levees"
According to Bush, he didn't realize there was anything wrong with the administration's response until almost four days after the hurricane. The first time he saw newscasts of the situation on the ground was on the morning of Sept. 2, when White House "Counselor [Dan] Bartlett made up a DVD of the newscasts so Bush could see them in their entirety as he flew down to the Gulf Coast the next morning on Air Force One." A $7.5bn (£4.7bn) compensation plan has been announced to help thousands of US residents affected by last year's hurricanes Katrina and Rita. Affected residents could receive up to $150,000 in what Louisiana's governor called "one of the most important programmes our state will ever run". However, direct relief is still months away and homeowners awaiting the aid could take on more debt in the interim. The Federal Emergency Management Agency issued overpayments of at least $174 million in its rush to distribute emergency payments to Hurricane Katrina victims, a newspaper reported Thursday. The U.S. Department of Homeland Security’s Federal Emergency Management Agency, in conjunction with other federal agencies, continues to respond to Hurricanes Katrina and Rita. Nationwide, there are 863 shelters housing 95,316 evacuees of Hurricanes Katrina and Rita nationwide. The U.S. Department of Agriculture’s Food Nutrition Service continues delivering food and facilitating delivery of nutrition assistance programs in affected states. Since Hurricane Katrina struck the Gulf Coast, 13.1 million pounds of commodities and two million pounds of baby formula and other baby foods have been obtained or purchased from existing sources. Approximately 5,480,000 pounds of commodities have been ordered to meet the needs of Hurricane Rita victims. To date, more than 1.9 million individuals and businesses have registered for disaster assistance from FEMA. FEMA’s Urban Search and Rescue Operations for the State of Louisiana were completed Sept. 30. The search and rescue teams helped 6,582 people reach safety and searched 22,313 structures in New Orleans and additional structures in Louisiana parishes impacted by Hurricanes Katrina and Rita to find those trapped or stranded. The Army Corps of Engineers has hauled 6,074,271 cubic yards of debris from Louisiana, Mississippi and Alabama. A total of 35,782 Department of Defense personnel are supporting relief operations for Hurricanes Katrina and Rita. (CNN) -- The president of St. Tammany Parish accused the Federal Emergency Management Agency on Sunday of continuing to mismanage the aftermath of Hurricane Katrina, a charge denied by an agency spokeswoman. "I met the president personally," Kevin Davis told CNN's "Late Edition." "I actually drafted a note, and he signed it. It said, 'We are going to help you,'" the parish president said. "I think he was sincere. He hugged me, and I believe in him. There is a disconnect apparently from that point down through the FEMA program." Civil liberties groups called the decision a violation of the traditional boundary between church and state, accusing FEMA of trying to restore its battered reputation by playing to religious conservatives. Louisiana parishes, cities and various departments of state government have already been approved for than $700 million in federal public assistance for expenses responding to Hurricane Katrina, and officials expect that amount to grow exponentially in the years to come. Mark Smith, a spokesman for the state Office of Homeland Security and Emergency Preparedness, said Sunday that the Federal Emergency Management Agency has received reimbursement requests from dozens of parishes and municipalities across the state, and expects all 64 parishes to make requests in the future. He said the amount of public assistance sought will be several billion dollars. Eight parishes, municipalities and state departments have already received about $218 million in reimbursements, and the remaining approved money should distributed soon, Smith said. He said the federal government has streamlined the reimbursement process, and federal funds are typically distributed a week after local governments submit their requests. Smith said federal officials understand that many local governments do not have the ability to collect taxes, which would severely limit their ability to provide essential services without federal help. “Everything’s been expedited to the max,” Smith said. Smith said the funds are used by local and state governments to pay for any Katrina-related expenses that were accrued after the state was declared a disaster area. Those expenses can range from repairs to existing infrastructure, to road clearing and public service restorations costs. In addition, overtime pay for local employees and law enforcement officers will also be covered by FEMA, Smith said. NEW ORLEANS, Louisiana (CNN) -- President Bush on Monday will get his first up-close look at the streets of New Orleans, flooded nearly two weeks ago after levees protecting the low-lying city broke. The visit is the president's third to the Gulf Coast region since Hurricane Katrina slammed ashore on August 29. Two days after the storm hit, Bush surveyed Katrina's destruction from Air Force One on his way back to Washington from Crawford, Texas, where he'd spent a month's vacation. He visited other parts of the region in two subsequent visits. NEW ORLEANS, Louisiana (CNN) -- With floodwaters receding and the body count rising, the Coast Guard officer in charge of the federal government's Hurricane Katrina relief efforts met Saturday with local officials in New Orleans to improve coordination. Vice Adm. Thad Allen, the Coast Guard chief of staff, said he met with the presidents of eight parishes in the New Orleans area to discuss "the unity that is going to be needed to move this effort forward."